Last week, the Conversion Interactive Agency team took a quick break from creating the mind-blowing client experience to have a little fun. Our management team brought us to Bridgestone Arena to have our monthly “All Hands Meeting.” Once the meeting wrapped, we were welcomed by the Nashville Predators to watch them practice for their big game against the Winnipeg Jets. Upon our arrival, we were greeted with a beautiful breakfast buffet in the Lexus Lounge. Our team mingled and really took in the experience of being behind the scenes of the National Hockey League (NHL). Once our first All Hands Meeting of 2019 kicked off, our team collaborated on what this year will bring for truck driver recruiting. We discussed our new data command center making its debut in Q1. The Conversion innovation team has been working tirelessly to create this tool for our trucking companies as a hub for where data-driven decisions live. “What got me excited about the command center was the fact that we can visualize all of the data from our advertising efforts,” said Digital Media Strategist, Cody Tisheuar. We also discussed what’s on the agenda for the upcoming Recruitment and Retention Conference in February. Along with our conference hosts, Transport Topics and the American Trucking Associations, driver recruiting professionals will be gathering in Nashville to learn, network, and connect. You can expect some incredible workshops, engaging general session speakers, and an event you’ll never forget! After Conversion Nation discussed business at our trip to Bridgestone, we moved onto the glass to watch the Nashville Predators skate and warm up for the game. Some friendly faces like PK Subban, Pekka Rinne, and Viktor Arvidsson greeted us on the ice. One of our team members even got a wave from Roman Josi. Social Marketing strategist Cole Landers said, “Going to Bridgestone and watching the Predator’s morning skate was an unforgettable experience.” As the practice was wrapping up, Executive Vice President of Sales, Brad Holthaus and Director of Innovation Lance Britton caught a puck that flew over the glass. What a way to end such a memorable experience! We were fed once again by the incredible catering staff at Bridgestone Arena. Our team mingled and strategized about the future of the trucking industry. It was an amazing break from helping our clients find qualified drivers. Our team returned energized and ready to help motor carriers brave the driver shortage in the United States. “Having the opportunity to go off-site for our All Hands meeting PLUS watch the Nashville Predators practice at Bridgestone Arena was an awesome experience! 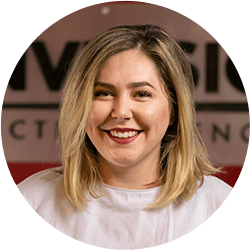 It’s so exciting to be part of a team that places an importance on working hard but also having fun while we’re at it,” said Sales Executive Kailey Spangenberg. Our entire team would like to extend our thanks to Bridgestone Arena, the Nashville Predators, and our Management Team for making our outing possible.